Update 11:15 a.m. Wednesday: O.P.P. say Michael Keyes has been located safe. CHESTERVILLE – Provincial police are trying to find a missing Chesterville man. 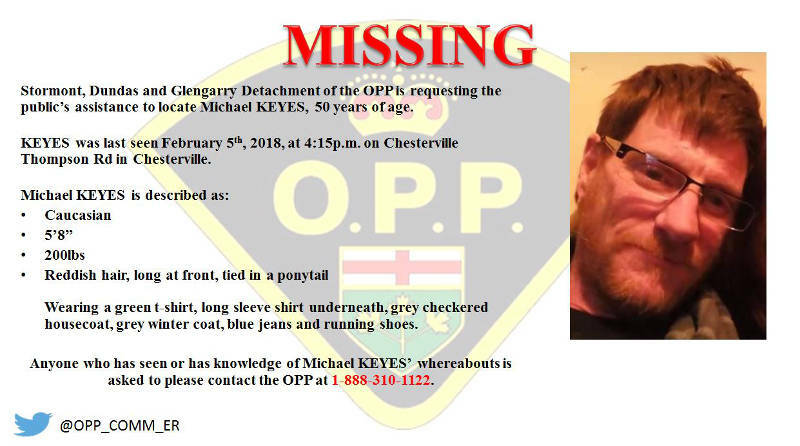 Michael Keyes, 50, was last seen yesterday (Tuesday) around 4:15 p.m. on Thompson Road in Chesterville. Keyes is described as white, 5-foot-8 inches tall and 200 pounds with reddish hair in a ponytail. He was wearing a green t-shirt, a grey checkered housecoat, grey winter coat, blue jeans and running shoes when he went missing. If you know his whereabouts, call O.P.P. at 1-888-310-1122.